Curly hair is not only harder to arrange but also more sensitive than other types of hair. When you choose a flat iron, you might need to pay extra attention to it in order to get the best product for your type of hair. Because certain flat irons might do more damage than good to your hair, you need to invest in the best one. Which is why in order to protect your hair and make it look good at the same time, you should look for specific features your flat iron should have. Here’s everything you need to know about flat irons and how to make the best decision when you are purchasing one! With so many models of hair straighteners and so many manufacturers trying to create the best product to satisfy their clients, it might be a struggle to find the best one for your needs. But once you know what to look for in such an item, your shopping process will be easier and a lot more pleasant. Here are the main characteristics that a flat iron should have to satisfy any type of hair. To be able to enjoy the maximum results from a hair straightener, you need to get one that is resistant and efficient. Keep in mind that flat irons made of ceramic are known for being the best ones when it comes to directing heat and they can’t be compared to those that have metal plates. Also, ceramic irons use negative ions which is perfect technology for avoiding the frizz effect that no one wants on their hair. So, even if you have to spend mpore on such a ceramic iron, look at it as an investment and don’t compromise when it comes to this aspect. The width of the plates might be a subjective matter but there are certain features that should help you decide what’s best for you. For instance, narrow plates will be able to access those uncomfortable areas in a better way so you will not have to struggle when you try to do complex hairstyles. This is why nowadays you will find plenty of irons with narrow plates since people tend to appreciate this type of design a lot better. Wide plates are good for thicker hair but even so, you could get away by using 1 and a half inch plates. However, if your hair is thin, you should be achieving the type of results that you want with plates that are as narrow as 1 inch each. There are also flat irons with plates of 1/2 inch but these might work only for specific types of hairstyles. To charm more customers, manufacturers added several features to the flat irons that they sell. And you can increase your comfort as much as you want by knowing what features are worth to invest in. For instance, a great feature is temperature control. You need this to choose exactly the temperature that you want for your type of hair. Another feature is the auto shut off function. This will shut off your flat iron automatically after only one hour of not using it. Besides the fact that this feature will save your hair straightener for getting worn out sooner and it will prolong its lifespan, it is also a safe feature that protects you in the situation in which you forget your flat iron on. Most likely you have a budget for such an investment and you are wondering if your budget is enough to get a great product. The good news is that you can find a flat iron for any type of budget so chances are that you will be amazed of how many options the market has to offer. Simply scroll through the different products and choose the one that has the best features for your desired price range. The market offers a wide variety of flat irons for different types of hair and needs. The more curly your hair is, the more important it is to get the best flat iron to tame it. And if you are not sure what are the products that lead this sector of the market, we gathered them for you so you can make up your mind even faster and easier! Keep in mind that what works for others might not work for you so, find the flat iron that suits your expectations! BaBylissPRO might be just what you need to tame your curly hair as it is one of the best digital straighteners that can be found on the market. It has titanium plates and the heater is made of ceramic. The maximum temperature that this flat iron can reach is 450 degrees F which is more than enough to tame a curly and rebel hair. A very useful feature is the memory one which records the last temperature so you won’t have to set it up every time you use this iron. It is important to note that this flat iron provides even heat so your hair will not be burned or damaged at all. Every time you use this product, you will end up with a smooth and shiny hair that everyone will admire! This 1.25 inch plates hairstyling iron is just what you might need to get the hairstyle of your dreams without having to leave your home. It is made of titanum and ceramic which are the best materials on the market when it comes to flat irons and it can be used for a long time. The product comes with a warranty of 2 years and plenty of features to enjoy such as a temperature memory function and a mode button. This iron comes with dual voltage which makes it even more functional and efficient and you will also receive a red thermal mat along with it. You can use it to create a variety of hairstyles and look different every day if that’s what you want. And all this can be done with very little effort. Another great option when you are shopping for the best flat iron for curly hair is this LumaBella product. The plates of this iron are made of ceramic but they also come with micro-conditioners that give your hair a healthy shine every time you use this product. It also has a dual touch function and it will not get over heated at all which means no damage for your beautiful hair. The keratin in the micro conditioners that can be found in the plates also treat your hair by providing the effect of a conditioning treatment. You can safely use this flat iron without being concerned about any side effects it might have on your hair. It gets instantly to the temperature of 450 degrees F and it will adjust automatically to the temperature that is healthy for your hair. RUSK offers a high quality flat iron for your curly hair that you might fall in love with from the first time you use it. It is a digital ionic hair straightener that eliminates fizz and keeps your hair smooth and shiny for a long time after you use it. This flat iron is made of a ceramic heater and it has resistant plates of titanium which increase its durability and efficiency. For optimum results you should place the plates close to your roots and slide your hair in between them while you pull down until you reach the edges of your hair. You will notice that you will gain a fresh and elegant look instantly and without spending money to go to salons. Most likely, you will be able to enjoy this product for many years to come! You can use this flat iron to straighten your hair but also create waves and curls according to the hairstyle that you are going for. Your hair will look healthier and shiny every time you use this flat iron to style it. Thanks to its cutting edge technology, you will notice that this iron is perfect for adding volume to your hair as well. Also, you can set up the temperature easily by using the buttons for temperature control. Once you establish a certain temperature, this flat iron will remember it and keep it for next time you use it. Your hair will never be burned or damaged in any way even if you use this product on a regular basis. One of the best flat irons for curly hair that you can find is this Revlon model that can amaze you with its convenient features while its price remains within the budget friendly range. The plates of this flat iron are built in order to encourage fast straightening process so you will not spend a lot creating the hairstyle of your dreams. It will not give you frizz effect for at least 24 hours after using it. Also, this iron prevents hair damage with 81 % and comes with an auto dual voltage. You can use it anywhere you want and end up with a great hairstyle in a matter of minutes. If you are looking for an affordable flat iron for your curly hair, this might just be the best option for you! This HSI professional flat iron comes with special sensors that prevent hair damage. You can rely on this product for a long time and be sure that it will not burn your hair as long as you use it correctly. Each plate is made of ceramic and has 8 heat micro sensors that protect your hair. This also helps heating your hair evenly for better results. You will not have to worry about fizz at all while using this flat iron. You can adjust the temperature from 200 degrees F to 450 degrees F according to your type of hair but also the type of hairstyle you want to create. Thanks to the titanium tourmaline, this iron will heat up in seconds so you don’t have to wait a long time to get it to your desired temperature. You can use it to straighten your hair but also to create romantic waves that will charm everyone who sees them. This flat iron comes with mirror titanium plates and it is very efficient when you want to tame curly hair. It is a digital flat iron that comes with a very comfortable to read LCD background display. You will be able to set the temperature between 265 degrees F and 450 degrees F by using the temperature control function. And to make this product even better, it comes with 2 years of warranty which makes it even more reliable for first time clients. Over all these features, this hair straightener comes in a modern design and a very comfortable grip that way you will relax while you are doing your hair and not struggle to hold it in your hand. It is definitely one of the best options that are on he market. KIPOZI is a great company that offers a high quality flat iron to consider, with incredible and useful features. The titanium plates of 1.75 inch provide an even distribution of heat on your hair so it will not get damaged at all while you are using this straightener. You can choose to straighten your hair or create curls and waves thanks to its 2 in 1 design and the LCD display which allows you to control it very comfortably. The temperature can be adjusted between 170 degrees F and 450 degrees F according to your needs. And along with this flat iron you will also receive a velvet pouch, perfect for travelling. It seems that KIPOZI flat iron has everything you need to get that perfect hairstyle that you want in just a matter of minutes. Another great option to be able to straighten your hair every time you want is this Xtava flat iron. It is a high quality infrared flat iron that will reduce the frizz and not damage your hair at all even if you use it on a daily basis. The plates are 2 inch in size and made of a floating tourmaline that allows your hair to be smooth and shiny long after you straighten it. You can choose between 10 different temperatures by using the LCD display with the minimum one being 265 degrees F and maximum 445 degrees F. if you have thick hair you should use this flat iron at higher temperature in order to obtain the results that you are looking for. If you don’t use this product for 60 minutes, it will shut off automatically which makes it very safe and reliable! And it also comes with a 2 years warranty that you can use in case of having problems with it. Using a flat iron is easy, especially since all manufacturers will provide specific instructions on their products. However, even so, there are certain aspects that you need to take into account when you use such a product to straighten your curly hair, if you want to obtain the maximum benefits from it. So, every time you straighten your hair, keep these tips in mind! When you are using a flat iron, you should make sure that your hair is prepared for enjoying its benefits without taking any risks. Even if the majority of these products will also have functions to protect your hair against different heat levels, that doesn’t mean that you can’t take your own measures to help your hair be healthier and look better for a long time. Start by using products that will prepare your hair for exposure to heat such as moisturising conditioners. These shampoos and conditioners will nourish your hair and offer it the nutrients it needs to face the treatments. Also, you can find products that are made to give you a straight and sleek hair which will only help the straightening process. Also, you should consider applying a serum that will offer your hair thermal protection during the straightening process. These serums are applied on et hair, evenly, before using your flat iron. Make sure to comb your hair after applying the protection serum and if you don’t have such a product, coconut oil will work just as fine. When it comes to creating the hairstyle that you want, technique is the secret to success. To ease your job, you can start by separating your hair into as many sections as needed. The minimum number of sections is three but ultimately it all depends on the type of hair that you have and how thick it is. Thicker hair might need more sections than thin hair so you will have to discover what works best for you. Clip the sections of hair that you are not using and focus on straightening only one section at a time. By doing so you will also finish your hairstyle faster and with less hassle. You can even gather all the sections that you are not straightening, on the top of your hair just like professionals do it, or in a ponytail. Run the flat iron two or three times over the same section for best results. The more you straighten your hair, the more you will know how to do it the best way for you without spending a lot of time at it. You can treat your hair even after you are done with the straightening process. There are several sprays that won’t only fix your hairstyle but they will keep your hair straight for a longer time. As you can see, choosing the right flat iron for curly hair is not so difficult if you know exactly what to look for. By following this shopping guide you will make the best decision regarding your future hair straightener and you will be able to enjoy it for years to come. Pay attention to the features of such a product and make sure it is the best choice for your type of hair before investing in it. 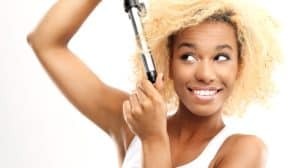 Once you find your flat iron, you will be able to create all those amazing hairstyles in the comfort of your house and save a lot of money on the long run. Plus, you will have the freedom to change the way your hair looks as often as you want! And styling your hair at home can be also a lot of fun, as long as you have the best tools for doing so!